Utilizing the EzyDog Soft Touch Webbing™ and a generously sized neoprene handle, this leash really is a pleasure to hold in your hand and is perfect for walking and jogging with your dog. The Zero Shock Technology adds protection from sudden moves made by you or your dog, a need still in demand well beyond the training stage. 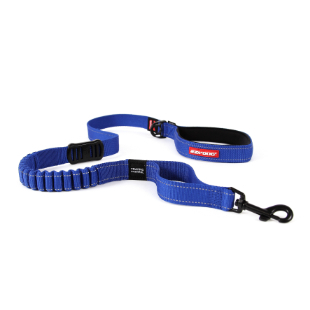 Make your walks more enjoyable and comfortable with this shock absorbing leash. Your dog will love it too. It is durable, comfortable and highly functional – who said you can’t have it all! 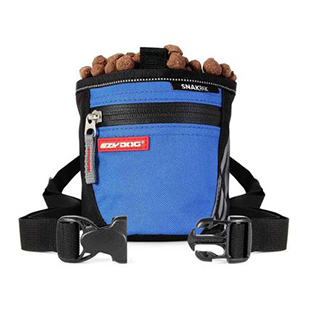 Don't forget to pair the Zero Shock dog leash with a unique dog collar or durable dog harness from EzyDog! Zero Shock Leash for the win! This leash has it all- shock absorption, padded comfy handle, rubber grip-stop on the leash, utility ring for poop bag dispenser, great colors, traffic loop, and the snap hook is great! Only thing I wish, is that it came in a 5ft length instead of 4ft. But this leash is amazing and I recommend it to anyone looking for a comfortable, well made leash to walk dogs that may pull! This leash is awesome! I recommend it for anyone that has a big dog that can pull at times. What a fabulous product! It should receive an award for being the most innovative dog product of the decade! What a helpful product is helping me train our energetic, 50 pound, 7 month old golden retriever puppy on proper lease behavior. This is a great leash. I love the comfortable handle and the zero shock feature. We purchased the zero shock leash along with the new harness. Our Cardigan Welsh Corgi likes to pull at times and causes me discomfort with back injuries that I have. The zero shock has helped Kai to refrain from pulling. It has also helped me tremendously by removing the shock from the leash pulling with the stretch allowed in the leash. The only reason I did not give it 5 stars is because for a Cardigan Welsh Corgi the leash needs to be about a foot longer. We are not able to use the functionality to shorten it either. One more foot would make our life easier when he goes potty and I have to clean up otherwise hes in the way at times. If that option were available i would give it 5 stars. Ordered blue received purple. Just kept it because it was to much trouble . On other leashes! So mad at myself. I wish I purchased this leash from the start. If you're reading this review, you're probably hesitating, like I was. The leash has EVERYTHING you would want in a leash, the zero shock is just a plus. 1) The soft neoprene handle is fantastic. 2) Large D ring near the handle for your poop bags and I always carry an extra 3"/5" carabiner just in case. 4) Attachment point, great quality. If someone put a gun to my head and asked me if I could change ONE thing, it would be the attachment point. I've used StuntPuppy's one handed attachment point and we've really fell in love with that. But it really is just a luxury add. This leash has everything you're looking for. If you're hesitating, don't. Buy this leash and you and your best friend won't regret it! This is a quality leash and comfortable to use. Good for a young energetic puppy. Sometimes my Frenchies wake up and think they are mini sled dogs and they pull, pull, pull! These leashes are genius and settle the dogs into a nice gait without harsh corrections. It's funny: they know which color is theirs, thanks for a terrific, well-thought out product.